KUALA LUMPUR, WEDNESDAY 6 February 2013 - Astana being the only Asian Pro Team, Kazakhstani superstar Andrey Kashechkin and his compatriot Alexandr Dyachenko are natural favourites for the best Asian rider overall classification of Le Tour de Langkawi to be contested from February 21st to March 2nd. 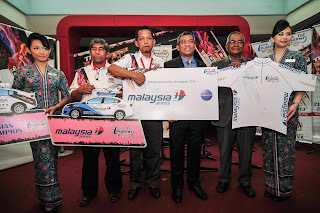 In announcing Malaysia Airlines's (MAS) sponsorship which also includes the white jersey for the best Asian rider of the race, MAS Regional Senior Vice President, Malaysia and Asia Muzammil Mohamad said that having just joined the prestigious oneworld alliance on 1 February and becoming oneworld’s Southeast Asia hub airline, it makes good business sense to be a sponsor for the Asian Champion jersey, the overall leading rider among Asian participants at the tournament. “With the Malaysian Government’s Economic Transformation Programme (ETP), the focus is to shift the growth of tourism to one of growing yields. 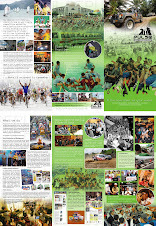 MAS finds that sports tourism is a key enabler in providing that support for growing yields where our foreign visitors are keen to spend on quality products and services during their stay in Malaysia.” He added. "We aim to leverage on this initiative to position our brand growth presence, against the front-end and corporate air travel market. 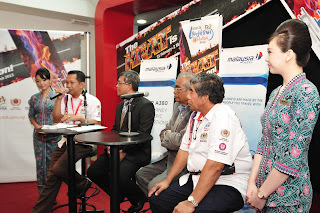 We are indeed honoured to be part of this strategic collaboration and partnership with the Ministry of Youth and Sports, the organizers of the Le Tour de Langkawi 2013.” Muzammil concluded. 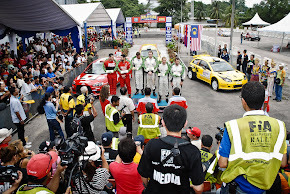 The competition was introduced in the third edition of the Malaysian event in 1998. 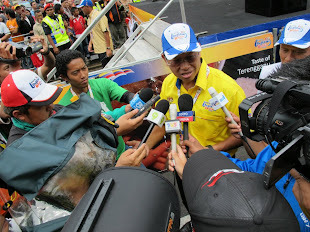 The inaugural winner Tonton Susanto won it again in 2002 and 2009. Therefore, he holds the record ahead of Hong Kong’s Wang Kam Po and Iran’s Ghader Mizbani who came first on two occasions but he won’t be able to run for a fourth crown as he missed out on the final selection of the Indonesian national team. Defending champion Dyachenko finished fourth overall at last year’s Le Tour de Langkawi. “Coming back with Astana and knowing the identity of our race with the strong impact of Genting Highlands, Dyachenko will be a favourite for the Asian competition for the second year in a row”, predicted the chief operating officer of Le Tour de Langkawi Emir Abdul Jalal. 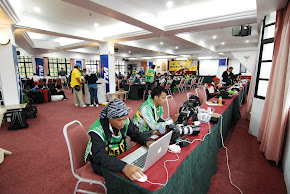 Ten trade teams registered in Asia and two national teams (Malaysia and Indonesia) will participate to the 2013 LTdL for an estimated number of 57 Asians – out of 132 expected starters – from nine different countries (Japan, China, Malaysia, Korea, Singapore, Kazakhstan, Indonesia and Iran). 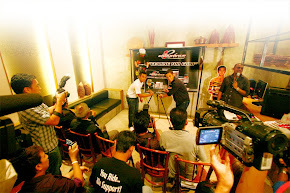 That leaves ambitions for the best Asian rider competition to the likes of Japan’s Shinichi Fukushima (Nippo), 41, returning for the tenth time to the race where he won this blue jersey back in 2008, to his compatriot Takeaki Ayabe (Aisan) who won the Cameron Highlands stage two years ago, to China’s Wang Meiyin (Hengxiang) who won the King of the Mountain competition at last year’s 2.HC Tour of Hainan, and to Iran’s veteran Hossein Askari who claimed this title at the 2006 LTdL. 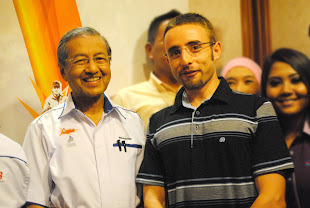 Malaysia expects Terengganu’s climber in the making Mohammad Saufi Mat Senan to challenge them. He’s got the ability to become one of the best GC contenders in Asia. 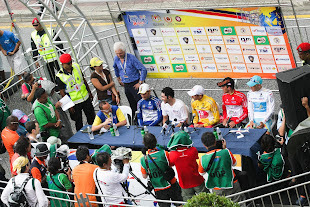 Asian sprinters will target the blue jersey in the first two stages prior to tackling Cameron Highlands. 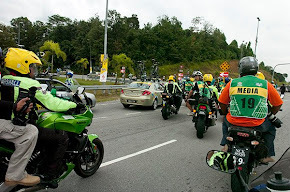 While Europcar’s Yukiya Arashiro – the only Japanese to have completed the Tour de France on three occasions – is expected to lead out the new French bomb Bryan Coquard, Korea’s Park Sung Baek (KSPO), a former Asian champion, Japan’s Taiji Nishitani (Aisan) who won stage 4 of the 2010 LTdL at Parit Sulong, and Iran’s Hossein Nateghi (Tabriz) will be the main competitors for the famous trio of Malaysian sprinters made of Harrif and Zamri Salleh from Terengganu and Anuar Manan (Synergy Baku) who remains the only Malaysian to have won a stage at LTdL up to date. “There’s plenty of excitement to come up from our local boys”, warned Emir Abdul Jalal. 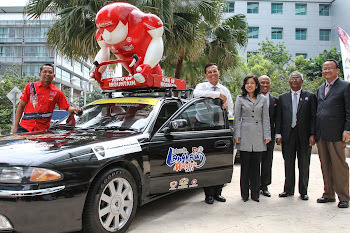 The LTdL 2013, which carries the slogan "The Heat is On", will officially begin in Kangar on February 21 and the race comprises 10 stages, covering 1469.7 kilometres. 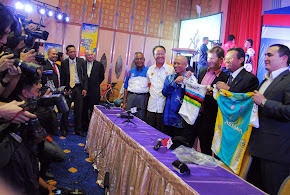 The race is sanctioned by the International Cycling Union (UCI) as a 2.HC (hors category) race on the UCI Asia Tour calendar, organised by the Ministry of Youth and Sports, via the National Sports Council (NSC) in association with the Malaysian National Cycling Federation (MNCF).